and for other Wordless and Watery Wednesday participants. Fountains are so refreshing. These are beatuiful as well. Lovely fountain. I can see where it would be a good place for a rest. 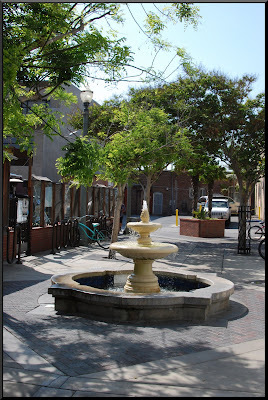 Nice photos of the fountains! Love the small town look. Thanks for visiting my site. I love fountains they are so relaxing. If I was going to pick one the first would be my choice it looks like it has more sunshine near it to keep me warm! 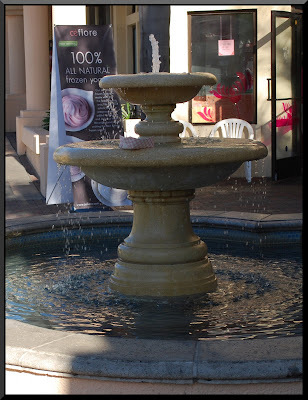 Fountains are always so eye pleasing in a public town area. Very peaceful and relaxing. Great fountains... a nice place to sit, listen to the water splash and reflect on the day... or perhaps some lunch. I like fountains - last year we had drought and they stoped ours here- but this year we have planty of rain - it is good thing to watch the water falling. I don't play this but I too love fountains. They are terrific places to sit and just relax. Something we could all use now and then in this busy & fast paced time we live in. Looks very cool and refreshing! Love the fountains. Nothing like that could survive our Canadian winters so the outdoor fountains look exotic to my eyes.